For additional information about this book, visit the website www.eyeyogabook.com. Many of us are looking for ways to maintain and even improve our vision. 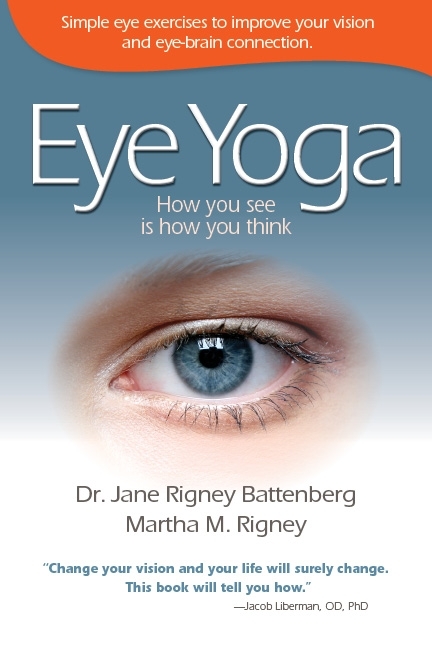 Drawing from such diverse fields as brain neuroplasticity, Neuro-Linguistic Programming and natural vision improvement, Martha Rigney and Jane Battenberg make important connections between the eyes and brain that can reawaken deep brain capacities through simple eye exercises. In Eye Yoga: How You See is How You Think, you will find easy-to-follow diagrams and photographs that help you perform the exercises with ease, whether alone or with a partner. Eye Yoga is written in an easy, light style, offering a depth of experiences and references. Introducing advanced research, Martha and Jane reveal essential insights concerning the eye/brain and TV-watching, video games, the effects of colors, stroke recovery, visualization therapy, the irises’ ability to reflect our innate personality, and many other topics. Prepare to be entertained as your eyes are opened to new possibilities. Jane Battenberg, M.A., D.C.H., a doctor of clinical hypnotherapy, is an author,a Time Dimension Therapist, and a Neuro-Linguistic Programming master trainer. She has a therapy practice, which includes phone sessions. In addition, she gives workshops internationally and lives in Orange County, California. Martha Rigney is a natural vision improvement educator with a background in vision therapy and alternative methods for health improvement. She leads educational and experiential workshops and speaking engagements, while maintaining a natural vision improvement practice in Raleigh, North Carolina.